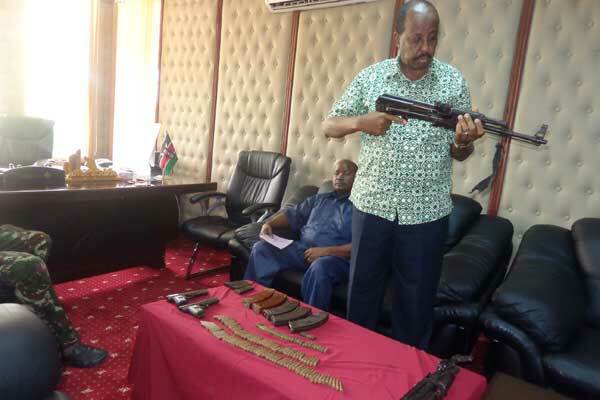 Police found guns, bullets and grenade believed to be owned by the Al Shabaab militia in Wajir town on Saturday. The weapons which included 137 assorted bullets, two AK 47 rifles and five magazines, two American Colt pistols, two live grenades, two detonators plus three pistol magazines were found by the police during a route patrol. According to Northeastern regional coordinator Mohamed Saleh, the weapons belonged to a wanted terror suspect Mohamed Kuno who is still at large and being pursued by the police. He said that the recovered weapons are believed to have been used in past attacks on people and businesses in the area. Last year, the police placed a Sh 2 million bounty on Kuno who is said to be one of the commanders in the Al Shabaab militia and has been working closely with two others terror suspects Mustafah Hato and Mohamed Kuno alias Gamadheere. Police operations in the area have been intensified following the attack by the Al Shabaab on an Amison base last week where dozens of Kenyan soldiers were killed. The residents of areas bordering Somalia have also been on high alert following unconfirmed reports that the millitias have regrouped and are planning a major attack. Saleh also said that the recovery of the weapons is a great step towards fighting the militia presence in the are since they were recovered by efforts of both the police and local residents who gave the information. He said that if collaboration between security forces and the residents continue, there will be major achievements by the end of this year.